Metabolic syndrome is a dangerous physical condition that increases your risk of severe disease. A visit to Valley Diabetes & Obesity can clarify your next steps to avoid or treat this condition. Dr. Gopika Gangupantula is an experienced physician qualified to assess your situation. 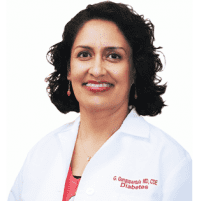 Contact her practice in Modesto, California today to optimize your health. Metabolic syndrome refers to a cluster of physical conditions that simultaneously occur, increasing your risk of heart disease, stroke, and diabetes. This combination of harmful ailments includes high blood pressure, high blood sugar, excess body fat around the waist, and abnormal cholesterol or triglyceride levels. What are symptoms of metabolic syndrome? Metabolic syndrome isn’t easily discerned as most of the disorders associated with it reveal no direct symptoms. However, you can still look out for symptoms of diabetes if you have high blood sugar, and a large waist circumference is a visible sign indicating excess body fat around the waist. Age - The risk of metabolic syndrome increases with age. Race - Statistically speaking, Mexican-Americans seem to be at the greatest risk for developing metabolic syndrome. Health problems - Carrying too much weight, in particular around your abdomen, increases your risk of metabolic syndrome. If you had gestational diabetes during pregnancy, or have a family history of type 2 diabetes, you may also be at a higher risk. Other diseases - You are at a higher risk of metabolic syndrome if you’ve ever had cardiovascular disease, nonalcoholic fatty liver disease, or polycystic ovary syndrome. What are complications associated with having metabolic syndrome? Experiencing metabolic syndrome can increase your risk of developing harmful chronic conditions. These can include diabetes and cardiovascular disease. Discuss with Dr. Gangupantula lifestyle changes that have the potential to subdue these risks. What are treatments for metabolic syndrome? Dr. Gopika Gangupantula is a qualified physician passionate about guiding you back to health. If implementing lifestyle changes such as diet and exercise don’t suffice, she can suggest further measures to control your blood pressure, cholesterol levels, and blood glucose. Dr. Gangupantula evaluates the specific causes related to your onset and can provide a customized treatment plan for your needs.